Sunday roast is a traditional British meal served on Sundays for lunch. 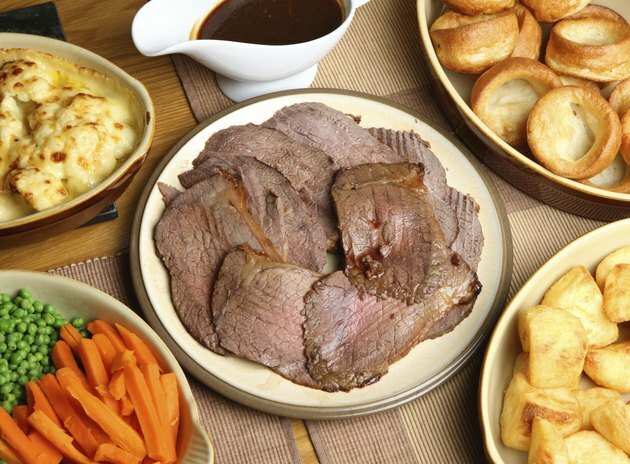 A typical Sunday roast consists of roasted meat or poultry, roasted potatoes, vegetables, and other complementing foods and sauces such as stuffing, Yorkshire pudding, gravy and mint sauce. A 100 g, or 3.5 oz., serving of roast chicken breast contains around 170 calories. A 3.5 oz. serving of roast beef has 135 calories, and a similar portion of roast leg of lamb has 235 calories. Vegetables typically served with Sunday lunch include carrots, peas, green beans and parsnips. One ounce of boiled carrots has 7 calories; the same quantity of green beans has 10 calories. An ounce of boiled green peas or parsnips provides about 20 calories. A 3.5 ounce serving of mashed potato and butter has 105 calories. Roast potatoes have around 150 calories per 3.5 ounce serving. A 100 g, or 3.5 ounce., serving of gravy has around 54 calories. A 50 gram, or 1.7 ounce serving of stuffing has about 70 calories, and a small 18 g, or 0.6 oz., Yorkshire pudding has 50 calories. A typical Sunday Roast consisting of 3.5 ounces of roast chicken, 3.5 ounces of mixed roast and mashed potatoes, 4 ounces of boiled vegetables and a serving of gravy provide around 400 calories. Adding two small Yorkshire puddings and a portion of stuffing increases total calories to around 565. A full Sunday roast with all the accompaniments and large portions of meat and potatoes equals about 850 calories.